Ye Olde Art Shoppe: Reminder! Computer Class is Tomorrow! Reminder! Computer Class is Tomorrow! 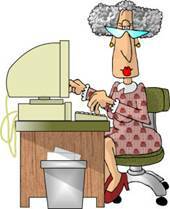 Get acquainted with your computer....beginners class starts tomorrow, Saturday 9/14 at 11 AM. Bring a lunch, we'll take a long break! Learn where to find the basic tools in Windows, learn some email options and better browsing tips. Move at your own pace and get answers to any puzzling questions you might have! Read more at original post.